The World's Largest Paint Ball! Welcome to the home of the Worlds Largest Paint Ball and one of Indiana's most visited roadside attractions. Created and owned by Mike and Glenda Carmichael from Alexandria. The Ball of paint all started with an ordinary baseball. Yes, that same baseball you have sitting on your garage shelf in a mitt waiting for someone to play catch with it. 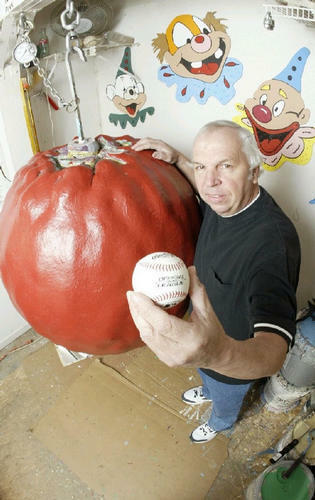 Imagine that baseball with over 23,400 layers of paint on it and weighing in at over 4,000 pounds. That's what Mike and Glenda have been doing for the past 36 years with the help of friends, family, and visitors. This ball is truely amazing and you must see it to believe it. You might have seen the Ball of Paint on various television and radio shows world wide. We’ve also had numerous articles written in your local newspapers, magazines, and books including editions of Ripley’s Believe it or Not and the Guinness book of world records. The Ball of Paint has been filmed for commercials in the Netherlands and also appeared on talk shows in China. Were even on YouTube!